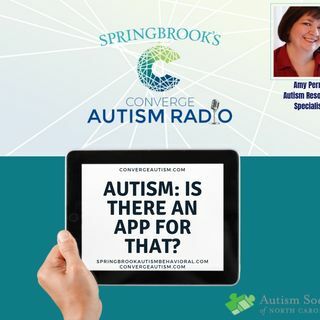 Tune in we interview Amy Perry discussing how using technology such as the iPad with certain apps can be so beneficial for those on the Autism Spectrum. Amy Perry is an Autism Resource Specialist for the Autism Society of North Carolina covering the Fayetteville / Fort Bragg community and 8 surrounding counties. Amy is a former military spouse with three daughters; ages 23, 21 and 16. Her 21-year-old daughter was diagnosed with autism before the age of two; she also has two nephews with ... See More ASD. Because of her own experiences 7with her daughter, she is passionate about empowering families to help their children and family members succeed with autism. She connects parents and individuals with autism to community and school resources. She educates parents on receiving an autism diagnosis, special education services and IEP’s and often attends IEP meetings with families. She conducts monthly workshops for parents of Newly Diagnosed children with autism. She speaks regularly in her community to a variety of schools, universities, professional groups and parents on a wide variety of autism related topics. Amy regularly attends conferences to stay educated on best practices and emerging research for autism. Professional Development has included (but not limited to) sessions with Peter Wright, Jed Baker, Tony Attwood, Sally Rogers, Barry Prizant, Michelle Garcia Winner, Brenda Smith Myles, and Temple Grandin. Amy was trained by the National Academy of Child Development to create a home-based program for her daughter, she has trained and mentored support staff for 18 years. Amy is the Co-Founder of The Autism Parent Retreat with Sallie Nowell from the Frank Porter Graham Institute. The retreat’s purpose is to strengthen families living with autism by caring for the caregivers and empowering them to support their children in new and creative ways. Amy attended Asbury College where she studied Broadcast Communications. Amy ‘s special interests include assistive technologies like the iPad that can educate and enhance the lives of individuals with autism. She will be one of the speakers at the March 2019 Springbrook Converge Autism Summit held in Greenville, South Carolina.